The Dermalogica Double Cleanse is designed to deliver your cleanest skin ever. Thorough cleansing is the most critical step in a at-home regimen, as it can deliver immediate skin care benefits. Because cleansing is so important, The International Dermal Institute created the Dermalogica Double Cleanse, the two-part cleansing routine that begins with Pre-Cleanse and finishes with a prescribed Dermalogica Cleanser. As part of the at-home regimen, the Dermalogica Double Cleanse can help achieve healthy, clean skin. All Dermalogica Cleansers are soap-free and acid-balanced to protect the skin's natural moisture barrier. Dermalogica Intensive Moisture Cleanser is a light, creamy cleanser that removes impurities while actively nourishing dry, depleted skin to minimize damage of vital proteins and lipids that defend against dryness. A Foaming cleanser that helps clear oils and bacteria on breakout-prone skin. Water-soluble Bentonite and Kaolin clays combine with purifying botanical extracts and refreshing Menthol to remove excess oils and refine skin's texture. A rich, creamy cleanser that gently lifts impurities from dry, sensitive skin while deep-conditioning and soothing irritation. A concentrated, soap-free, foaming gel designed to thoroughly remove impurities without disturbing the skinÕs natural moisture balance. 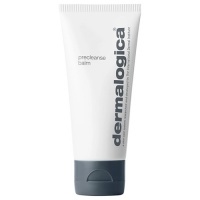 Achieve cleaner, healthier-looking skin with the Double Cleanse regimen that begins with Dermalogica PreCleanse Balm. A dual-action exfoliating cleanser containing Lactic Acid that smoothes, retexturizes and is designed to help achieve ultra-clean skin. A lightweight Olive and Apricot Kernel-based cleansing oil, fortified with Kukui Nut, Borage Seed and Rice Bran oils, that gently liquefies sebum and oil-based debris from the skin's surface. Water-soluble Bentonite and Kaolin clays combine with purifying botanical extracts and refreshing Menthol to remove excess oils and refine skinÕs texture. Contains no artificial fragrance or color.